What is the size of your problem? Middle brother got really upset and whiny yesterday when he was told to wait to go swimming. He took awhile to calm down. In the evening, I drew this on the doors of our wardrobe and did some problem-solving and brainstorming with them. When I asked him to identify where on the scale to place the size of the problem, he could rightly identify it as a small problem. When I asked where was the size of his reaction (a bit of crying and whining), he identified it as level 6 on the scale. This is the second time I’m going through this concept with the kids so he’s had some prior understanding of it. On the first occasion, I identified what a level 1 problem looks like, for instance losing a toy or dropping a spoon. While someone falling into the pool would qualify as a level 10 problem : where there is real and imminent danger. As for reaction, kicking, screaming or hitting would be level 9/10, while frowning or sulking would be level 1. In the middle could be whining or crying. Then I moved on to get them to think of ways that we could battle with the emotions of feeling frustrated and impatient at having to wait. So the next time he would have some strategies or ideas. I picked up this concept from a recent Social Thinking conference I attended. I learnt a few useful things in relation to parenting and helping kids with social / learning difficulties. This was one social tool that I immediately related to and started to apply at home. I think it’s extremely useful in helping kids think about their reactions. Here are some lessons you can point out to your child while applying this “size of your problem” tool. We always have a choice on how we act and behave – Our goal is to choose to behave in ways that are more acceptable and in line with the problem or situation. Our reactions should continue to move down the scale as we grow older and more mature, even though our problems may get larger and more challenging. Our reaction has an effect on others – When we react at level 9/10 on a daily basis, we regularly cause small problems to become BIG HUGE problems. Other people are affected by it and may start to have negative feelings about you. If they continue to react at such high levels when small problems occur, it also causes a lot of stress to their family and carers. Now all this may take a while to sink in and translate into real self-regulation and social consideration for others, but it’s definitely a good and helpful framework to introduce such social concepts to them early. 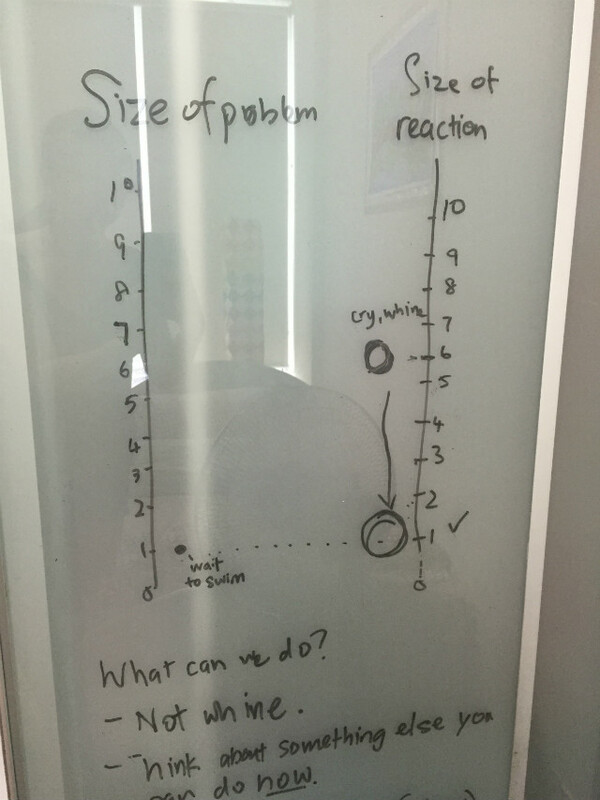 Whenever we meet with certain issues, I would stop and ask out loud “hmm, what is the size of this problem?” This gives the kids a chance to think and self-monitor, and measure their reactions accordingly. Note that it may not work if the kids are already emotionally strung or in the middle of a wild tantrum, but I’ve seen it work when they are just at the beginning stages of a negative emotion. Even for myself, when I mess up and over react, it gives me a chance to laugh at myself, and point out how I over reacted to a small problem. It has helped me to breathe and calm down, and not have big reactions to little things like a kiddo dropping his plate of food on the floor. This is something I’ll continue to work on with my kids. It’s not just teaching them self-awareness, it’s also imparting the skill of problem-solving. And when they have the right attitude towards solving the little problems that crop up in daily life, I believe they’ll also be better big problem-solvers in future, be it handling school-stress, relationships, or even work. 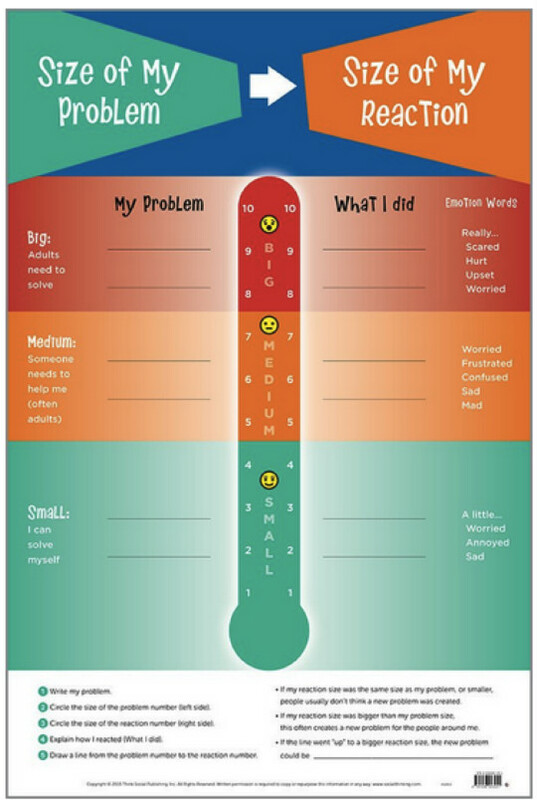 Here’s a shot of the size of your problem poster available from Social Thinking’s Singapore website. I really like this idea, June! I’m always telling my kids they are overreacting but a chart like this would really drive home the message. I’m glad, Mummybean. I thought the chart was really nifty too. Like… it breaks it down into something that’s easily understood and applied. But are kids ALWAYS overreacting? My opinion is that they do not. And moreover I think that child’s perspective and threas assessment will be different that adults’, and carers need to remember that – of course encouraging kids to find their own way and solve the problem and have a taste of it- it’s an experience leading toan empowerment. OFC dialoguing with adults and asking them for help empowers too (Vygotsky wrote about that). Love this! Shall try it on my four-year-old, who has had some epic meltdowns recently. Wow this is great! Also useful for adults. Guess a true sign of resiliance is being able to process level 8-10 issues in a calm, rational way, yet without denying the emotions we rightfully should feel. And to let go of the level 1-4 issues, instead of getting too hung up over them. I think this is also helpful as an aid for us parents to acknowledge the level 1-4 issues our kids might face, and help them deal with them, instead of dismissing them as ‘small matters’ alone. Yes, I think it’s a lesson on its own for adults as well. And also – for carers themselves espacially – to keep their (ours : ) ) emotions and reactions in check. So many male and female carers need that. Thanks for sharing this method. I can see myself going through this very soon!